As a pet bird owner, there are many situations where you may need to safely transport your avian companions. Visits to the vet for checkups, wing-clipping or nail trimming cannot be undertaken with a bird unless you have them restrained in a carrier or travel cage. You may like to travel with your bird, in which case it is imperative that you have a good carrier. If you live in areas prone to hurricanes or other intense weather events you may have to evacuate quickly and will need a way to bring your pet with you. What Are You Going To Use Your Bird Carrier For? You have many choices when deciding on the right carrier for your pet bird. It is worth taking the time to ensure that you make a good choice, as your carrier will often last for your bird’s lifetime. 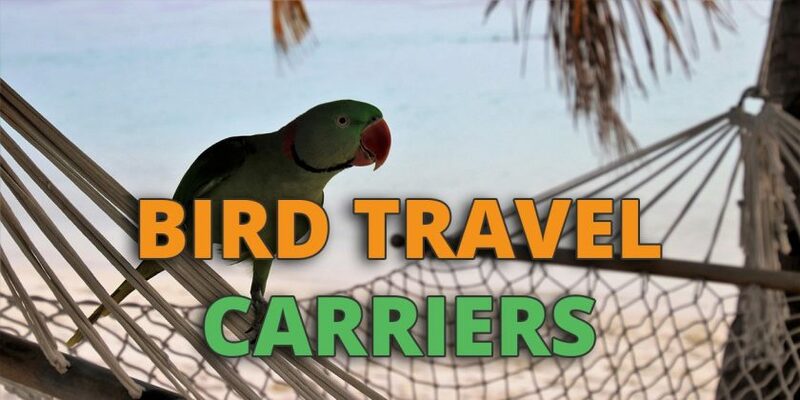 The best carrier for your bird will allow you to transport it comfortably and safely while subjecting it to the least amount of stress possible. 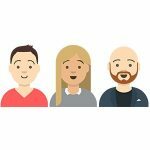 Here are some of the features that you need to investigate prior to making your purchase. The way you plan to use your carrier can have a major impact on which one you choose to buy. If the only time you plan on taking your bird out is for a trip to the vet, then you can go with a simple, no-frills model that can be strapped to the back seat of your vehicle. You may want to take your pet with you on hikes and other outdoor activities. Backpack bird carriers will probably be your best choice and are available for birds of all sizes. They often come equipped with bowls for food or water, as well as perches and panels that offer the bird a view of their surroundings or shade if required. 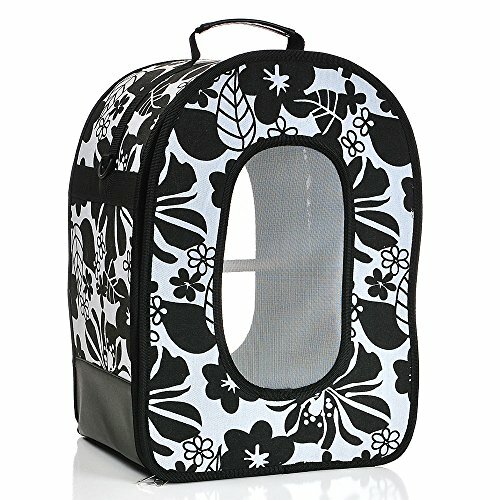 Cage carriers are a good choice for taking your bird on overnight stays. You can get carriers with a play top so your pet can spend some time out of the cage comfortably. Carriers are also available that are expressly intended to get your bird from one place to another, where it is expected they will be released to their regular cage or living arrangements. These are smaller and have fewer features, but will get your bird safely to your destination. 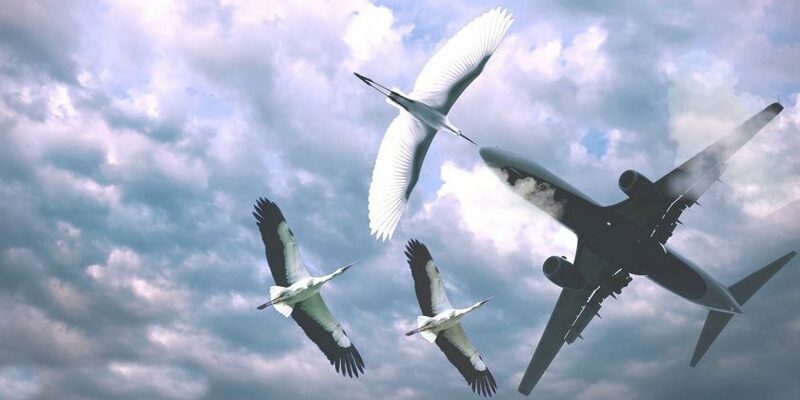 If you plan on flying with your bird, you will need to get an airline approved bird carrier. Size restrictions for keeping your bird under the seat may vary with different airlines, so be sure to research your preferred carrier. A more detailed guide to mailing your bird via an airline is available here. The most basic requirement for your bird carrier is that it is properly sized for your bird. You want the bird to be able to turn around inside the carrier at a minimum. All bird species will need a perch, and its placement is something that needs to be looked at before you choose a carrier. Some carriers have adjustable perches while in some cases the perches are not movable. You will want a perch of the proper diameter for your bird’s feet and that allows the bird to fit comfortably with clearance between the roof of the carrier and its head. The perch should also be high enough that your bird’s tail will not be touching the floor of the cage. Caution needs to be taken with smaller birds. 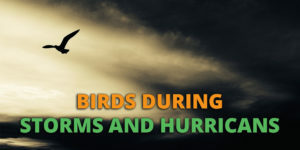 According to the website hari.ca, birds can become stressed in carriers made for larger birds and can also potentially escape through ventilation holes. Unlike their home cage, larger is often not better when looking at transport carriers. You need to take into account the possibility that your bird will try to chew its way out of the carrier, even if it is relatively happy in there. Small birds such as finches or canaries can be transported in a carrier made of plastic or sturdy fabric. 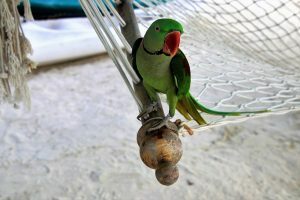 Any hook-bill can potentially be an aggressive chewer, and larger birds like cockatoos and macaws can chew and destroy even the better made carriers. Special care must be taken with stronger birds that can use their beaks to make an escape. If going with a cage-type carrier you should stick to stainless steel or aluminum. The beaks of larger parrots can destroy weaker cages and also these materials are lighter to carry than iron cages. If you opt for a backpack style bird carrier, you need to go with a top quality design that uses strong, durable, and bird-proof materials. The materials used to construct any mesh panels is especially critical in safeguarding your avian family member. Keeping your carrier clean is important, and a removable tray is a nice feature. Bottom grills that keep your bird off a potentially soiled carrier floor is also a good idea. Some carriers make it easy to use a substrate or paper lining for ease of cleaning. Try to avoid carriers with many crevices that can harbor food or waste and lead to bacterial growth. Pet carriers are available for under $40, and though they may not be designed specifically for birds, may serve the purpose for simple trips to the vet. 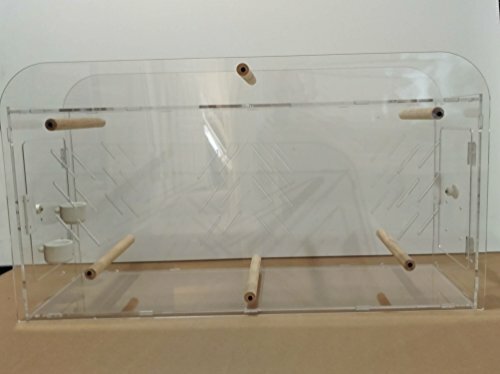 However, more high end bird travel cages and carriers will set you back several hundred dollars but are much more durable and will last a lot longer. I would suggest that price should not be the determining factor when choosing a carrier. The features that you desire may lead to a more expensive carrier but will result in one that is regularly used and enjoyed by both you and your pet. The primary concern should be that your bird is safe, cannot escape, and is as stress-free as possible. A few extra dollars spent will be repaid many times over with the peace of mind that comes with knowing your avian companion is comfortable and secure. Once you have determined which carrier suits you and your pet, you need to acclimate the bird to this newly introduced enclosure. Prior to attempting to transport your bird in the carrier, you need to help your bird feel safe and comfortable when it is inside. This may take some time, and you may find that certain birds never fully take to the style of carrier you have chosen. If your bird refuses to use the style you purchased, you may have to go in another direction to keep your parrot happy. If possible choose a travel cage or carrier that resembles your bird’s current home. This will lessen the time it takes for your bird to accept it. Place the cage in your bird’s room and let it get used to just seeing it as a non-threatening object over several days or weeks. Put some favorite toys and treats in the carrier while your bird is enjoying out of the cage time and let it investigate at its own pace. Avoid dangling toys as they can swing around and injure your bird during the ride. Teach your bird to drink from a water bottle. Not all birds pick this up at first but it is critical as water bowls do not travel well. Monitor your bird’s water consumption to ensure that they are drinking enough to stay hydrated. If staying in a hotel, ensure that it is a pet-friendly and smoke-free room. Latent smoke fumes can be deadly for your avian traveler. Health exams must be scheduled and a signed verification of health obtained from your vet before interstate travel. Talk to your vet about herbal supplements for motion sickness. Always fasten your bird’s carrier with seat belts in the back seat. Front seats can be dangerous as side airbags can deploy and cause injury. Bring enough of your bird’s favorite foods to last the whole trip. Bottled water that you know is safe is also recommended, as are cleaning and first-aid supplies. Bathe your bird and perform any grooming such as nail or wing clipping prior to your trip. In the week before you embark, supply your bird with stress formula vitamins and minerals. To minimize the risk of your bird falling off its perch, strap the cage so when the bird is on the perch it is looking out a side window. This gives it the length of the perch on which to catch its balance as the vehicle starts and stops. NEVER leave your bird unattended in your vehicle for even a few minutes. 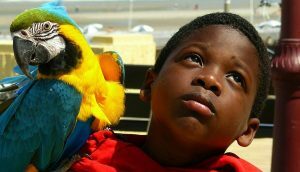 Below is a video demonstrating some tips on acclimating your bird for traveling. Celltei Pak-o-Bird – A large bird carrier backpack. Petsfit New Style Bird Carrier – Another versatile bird carrier backpack. Kings Cages ATT 1214 – An aluminium lightweight bird travel cage. A and E Cage Co. Soft Sided Travel Bird Carrier – A smaller sized bird carrier for short trips. Windridercreations Macaw Carrier – A see through/acrylic bird carrier. The Pak-o-Bird by Celltei is a full-featured backpack style bird carrier. It offers multiple carrying options as it can be used as a backpack, shoulder bag or strapped to the front of your body. The pack can also easily be fastened to your vehicle’s seatbelts. This is an excellent carrier that will serve you well both as an outdoor carrier and for transporting your bird in your vehicle. 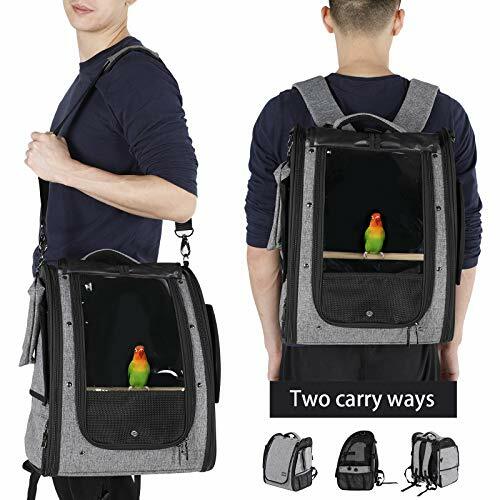 The New Style Bird Carrier from Petsfit is a nice backpack/shoulder bag style carrier that will work for birds less than 14 inches long. It features a 1 inch diameter perch and a stainless steel food bowl. Ventilation is provided by mesh sides and four 1-inch holes at the top of the pack. It includes a buckle for securing your pack in a vehicle. Side flaps can be put up for ventilation or down to provide shade or darkness for your bird’s comfort. Bottom tray slides out for easy cleaning. A nice feature of this pack is the inclusion of two pockets for carrying food and other supplies, making it an excellent pack to use if taking a day hike with your parrot. This is a nice pack for hiking but lacks some key features. 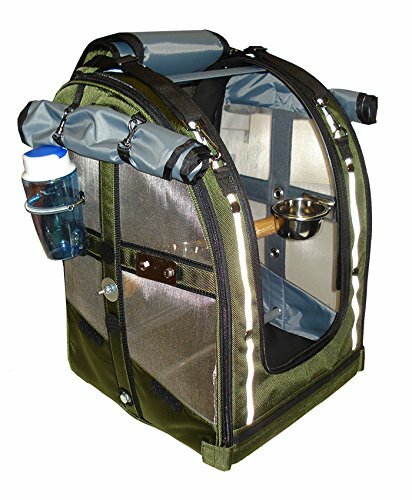 This is a sturdy and lightweight cage that makes a great carrier for short trips. It includes two wooden perches, one inside the cage and one that serves as the handle and lets your bird perch on top. It measures 17x12x14 inches and provides an inside height of 14.5 inches. The bars are substantial at 4.5 mm thick and the spacing is 5/8 inch. The Kings Cages ATT 1214 features a patented front door lock and uses magnets to keep the door tight and prevent rattling during transport. A slide out tray is standard for easy cleaning, and a stopper is included to prevent the tray from slipping out. The unit is easy to assemble and is available in 5 colors. The manufacturer claims this cage will outlast any powder coated cage. This is a good choice for short trips or overnight stays with a small to medium-sized bird. 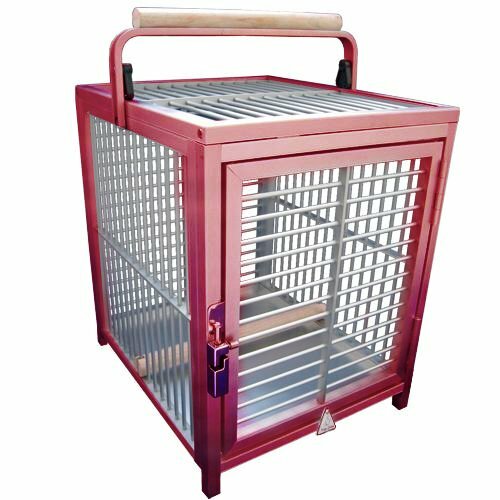 The Soft Sided Travel Bird Carrier by A and E Cage Company will work well for transporting small and medium birds for short distances. It features a top handle as well as a snap-on shoulder strap. Two sizes are available with the (small carrier) measuring 14.5×10.5×7 inches, with the (larger carrier) a more spacious 18.5×13.5×9 inches. The carrier’s front opens on 3 sides with a double zipper. Its decorative material can be obtained in black or green. If you plan on using your carrier mostly for trips to the vet, this economical bird carrier will work well for you. This is a serviceable carrier for short trips with small to medium-sized birds. Heavy – weighs in at 15 pounds. The Macaw Carrier by Windridercreations is an acrylic carrier that shows off your bird while it is being transported. It is essentially a large, transparent box that is made of materials that will stand up to any parrot’s beak. Specifically designed with the large tails of a macaw in mind, this carrier’s internal size is about 12x15x35 inches long. It comes with two water/food bowls and has ample ventilation holes to keep your bird comfortable. An inner, moveable perch is included and the handle also serves as a perch so your bird can spend some time out of its carrier. This is an excellent and nearly indestructible carrier for large birds. Hopefully, we have shown you some things to look out for when on the market for a bird carrier. Traveling with your pet can be stressful, but having the proper carrier can reduce stress on all involved and allow you and your pet to enjoy the trip.